The objects in the upcoming Made in the Americas exhibition tell about global trade and how it inspired artistic traditions around the world (see our previous blog post, Globalism and Culturally Inspired Craftsmanship). Furniture crafted from exotic tropical hardwoods is an important part of the story of early international trade as well. While the taste for exotic woods resulted in an aesthetic of dramatic color and contrast in furniture, it came at the high price of enslaved labor and a significant impact on tropical forests. Winterthur’s upcoming Sewell C. Biggs Winterthur Furniture Forum (April 7–9), Exotic Woods, Masterful Makers: Tropical Hardwoods and the Luxury Furniture Trade, 1600–1850, will explore the historic trade in mahogany and other tropical furniture hardwoods, look closely at furniture made from these exotic woods, and discuss the current status of mahogany and related commercial tropical hardwoods around the world. Currently on display in Winterthur’s In Wood gallery, this chest of drawers with doors will be one of the featured object studies at this year’s Furniture Forum. Made between 1650 and 1660 by Dutch or Flemish joiner-cabinetmakers who settled in London’s Southwark neighborhood, or by English craftsmen imitating their designs, the chest of drawers is an example of Netherlandish ornament popular in England in the mid-17th century. Intended for the upper middle class market, makers incorporated snakewood in this chest to contrast with the light oak, ebonized elements, and red cedar moldings in order to simulate the richness of aristocratic furniture. 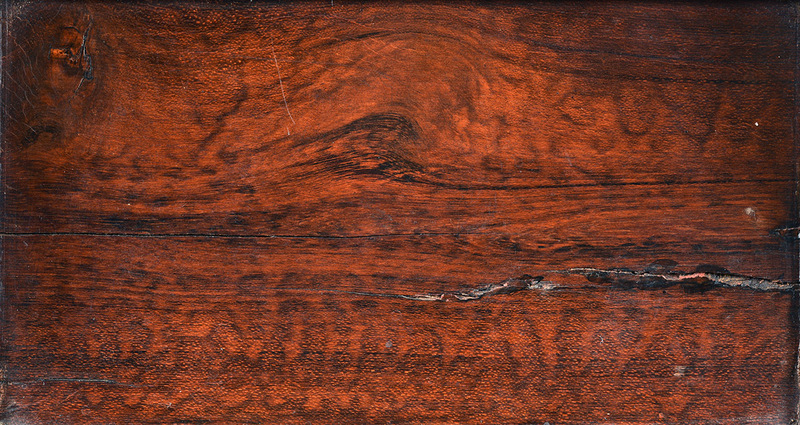 Snakewood (Brosimum guianense) is indigenous to northeast coastal South America and was a commodity shipped to London between the mid-1650s and 1675 from a short-lived English colony on the Surinam River in present-day Surinam. 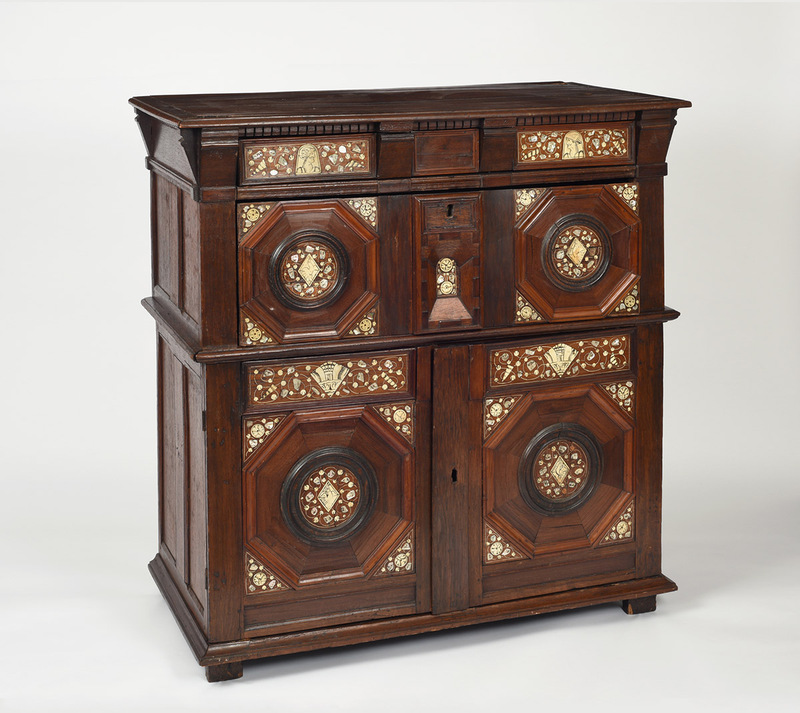 In addition to the contrast of colors created by the different woods in this chest (an aspect of the design that is less obvious today because of how the snakewood has faded), the makers incorporated mother-of-pearl and bone inlay (similar to many of the objects seen in the Made in the Americas exhibition). There is little attention to fine shaping in these inlaid details, most likely because it was intended for the upper middle class, not the aristocracy, and makers had to balance the time and cost dedicated to the decoration. See this chest and other furniture crafted from tropical hardwoods on display in Winterthur’s In Wood gallery, and learn more about these exotic woods at Winterthur’s Furniture Forum in April. Visit winterthur.org/furnitureforum or call 800.448.3883 for more information. This entry was posted in Academic Programs, antiques, exhibition, Exhibitions, Furniture, galleries, made in the americas, Uncategorized, wood working and tagged antiques, exotic woods, Furniture Forum, made in the americas, Winterthur, Winterthur Museum, Winterthur Museum Garden & Library. Bookmark the permalink.